Using the traditional Buddhist cosmology of the six realms of existence can help us see more clearly the conditioned patterns of body, speech and mind that cause suffering for ourselves and for our world. Each realm can be seen as a metaphor for a particular psychological pattern which is accompanied by a predominant emotional state. During this zakenkai, we will explore these realms to help us understand how karma manifests, both personally and collectively. This clear seeing of how we create and maintain karmic pain can guide us to a deeper understanding of the spiritual path of liberation for ourselves and for all beings. Zazenkai literally means “coming together for meditation.” BZC zazenkai’s are one day sesshins with traditional zen forms: zazen, service, dharma talk and oryoki meals. These are distinguished from our less formal one-day retreats, which have meals in the dining area and may include guided meditations, experiential offerings or group discussion. Please note that meditation instruction will still occur at 9 a.m., but there will be no public program after that. Registration closes November 11 at 11:59 p.m. Click here to register. Partial scholarships are available for retreats such as this one. To apply for a scholarship, please use this link and wait for approval before registration. Scholarship applications are due by November 4 at 11.59 p.m. In this sesshin, participants will practice the ceremony of oryoki, in which the sangha comes together in giving and receiving food in the meditation hall, using stacked and wrapped bowl sets, in a ceremony going back to our Chinese Buddhist ancestors. Oryoki meals are included in the cost of the sesshin. However, to receive their meals, participants will need a set of oryoki bowls. Participants may bring their own set. They may also rent an oryoki set for the duration of the sesshin or buy one through BZC (limited availability). If you intend to rent or buy an oryoki set, please complete this form by November 4 at 11:59 p.m.
To purchase an oryoki set, a suggested donation of $55 (members) / $65 (base/nonmember) / $80 (sustaining) is encouraged. If your intention is to rent a set, the suggested rental donation is $5/day. Please send in your payment by November 4. Payment options include the donate page on the website, PayPal at paypal@brooklynzen.org or Venmo @brooklynzen with a note indicating “Oryoki Set Rental”. You may also leave a check in the temple donation box on your next visit to BZC. Keep in mind that we are limited on storage space and therefore only a limited amount of sets will be available for rental. Oryoki will be practiced at future retreats and participants are strongly encouraged to have their own set. Please email info@brooklynzen.org with any questions, concerns or if other arrangements are needed. Please note that there will be NO alternative meal plan offered. The kitchen will send out the menu with ingredients listed to all registered participants the week before the sesshin, so that alternative arrangements can be made for those with dietary restrictions. Laura O’Loughlin is a dharma teacher and senior lay practitioner at Brooklyn Zen Center, as well as its co-founder. Before she began training with Teah Strozer, Laura was a student of Darlene Cohen’s. She is currently a psychotherapist, affiliated with the Buddhist Psychotherapy Collective, with her own practice in Manhattan. As a clinician, Laura uses mindfulness and body-oriented practices to support healing and transformation. Before co-founding Brooklyn Zen Center, Laura had trained and lived in various Buddhist communities since 1997, including Tassajara Zen Mountain Monastery and San Francisco Zen Center. Laura was also Director of Austin Zen Center, where among other things she studied the interface between eastern and western psychologies. 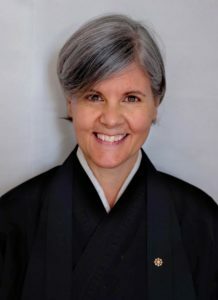 Laura received lay dharma entrustment from Teah Strozer in 2017. Access Notes: There is one short flight of stairs leading to the entrance to the building. Please press 3-0 to be buzzed in. The center is located at the top of a steeper second staircase of 28 steps. A ramp and elevator are available via an alternate entrance; please email in advance if you need access. Chairs, benches, and extra support cushions are available. We are not yet a fragrance-free space; our hand soap is scented with essential oils. If you have any additional questions about accessibility, please contact us at info@brooklynzen.org.